5-Acre Farmhouse w/Mtn Views & Basketball Hoop! 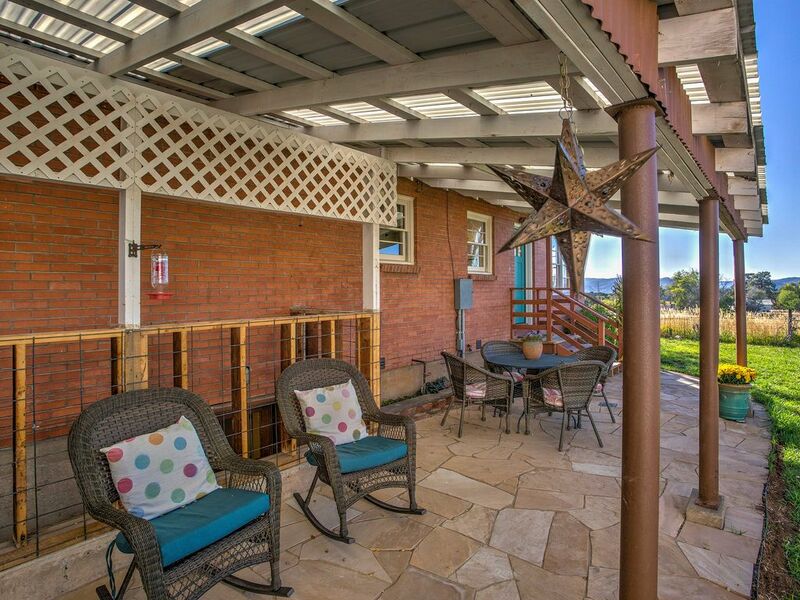 Mountain views in a tranquil setting await you at this renovated 2-bedroom, 2-bath vacation rental home in Durango! Nestled on 5 beautiful acres overlooking farm fields and breathtaking views of the San Juan Mountain Range, this brick farmhouse offers an unbeatable location for 8 guests to make memories together. Relax outside on the covered stone terrace, enjoy a cocktail amidst the mountain views, or play a game on the basketball hoop before lounging in this home’s beautiful interior. You simply can’t beat the mountain views that you’ll enjoy from inside and outside of this property! With 5 private acres to explore, you’ll likely be spending most of your time outside, which will bring you even closer to the stunning views of the farm fields leading up towards the San Juan Mountain Range. Out on the covered stone terrace, fire up the gas grill for a cookout and enjoy an al fresco meal at the dining set with the mountains as your backdrop. While you’re sipping your favorite beverage, the kids can start a game of Horse on the basketball court to stay entertained. Once you’ve had your fill of the fresh mountain air, step inside the charming farmhouse to make yourself at home in 1,900 square feet of totally renovated living space with outdoor views from every room. Prepare meals and desserts in the new fully equipped kitchen with Kitchen Aid appliances and ample counterspace. Serve your tasty masterpieces at the round dining table beneath the elegant chandelier, where you can also marvel at the mountain views through the surrounding windows. Follow the hardwood flooring from the kitchen and dining area, and into the spacious living area, complete with a comfortable couch, chairs, a ceiling fan, and a Smart TV - perfect for movie nights. Bring the party down the spiral staircase and into the Great Room, where you can play a game of billiards on the pool table, play board games or cards at the game table, or watch a movie on the Smart TV. When your eyes start to get heavy, throw your clothes in the washer and dryer and make your way to one of the pristine bathrooms to rinse off in the vintage clawfoot tub or walk-in shower for bed. Rest heavily in either the master bedroom’s king bed, the second bedroom’s queen bed, or the Great Room’s twin beds with twin trundles. Whether you’re seeking outdoor adventure, history, Victorian architecture, galleries, restaurants, or shopping, the Durango area has something for everyone to enjoy! Drive just 15 minutes to historic Durango, where you can find the perfect souvenir at one of their unique shops, or dine out at one of the many local restaurants. Here, you’ll also find music and dancing, a museum and arts center, and a fish hatchery. During the summertime, head to one of the river rafting companies, like Mountain Waters Wafting or 4 Corners Whitewater for a memorable experience floating down the Animas River! If you prefer enjoying the river from land, head to the 7-mile river walk, where you can bike or stroll along at your leisure. While in Colorado, hiking is never far away! Drive into the Rockies to find the San Juan National Forest, the Rio Grande National Forest, and many of Colorado’s famous, challenging 14ers. For easy arrival and departure, this home is also just 10 minutes from the airport! - Fantastic Durango location on 5 private acres - Easy access to restaurants, shopping, museums, river rafting, hiking and the airport! House isn’t the prettiest from the outside but the inside is completely remodeled and was perfect for our stay. The view was what sold us on this house and the host were amazing!! Will stay again! We loved this house. The view was beautiful, the house was well decorated, the appliances were all new and very nice. It’s really close to town. The owners were so helpful and friendly and wanted to make sure we had a great vacation. They gave us recommendations on things to do and places to eat. We would definitely stay there again. Perfect getaway for our family! Lynn and Robby were the perfect hosts and we loved our stay at their sweet farmhouse. I can't imagine having that view in my backyard everyday. We were there during a snowstorm and that led to beautiful snow to play in for the rest of the week. We didn't even go up to the mountain, we had everything we needed right there. The home is cozy but so roomy! The kids had their own space downstairs at night and my husband and son loved the pool table. The kitchen was stocked with all of the necessities and then some. Lynn and Robby went above and beyond as hosts with plenty of tips about the area. They even plowed the drive and porch while we were there! And Robby even brought over binoculars one day after a conversation about the wildlife in the backyard. The house was beautifully updated and clean. That shower and bathtub!! 😍� The beds were comfy and the home was warm and welcoming everytime we came back in from playing. We had an amazing time and hope to come back to this home again! The home is a bit of a drive from the center of town, but it’s also quiet and the views are incredible. Super clean and had everything my family needed. The hosts were very responsive and even shipped back a jacket my wife accidentally left behind. Highly recommend it for a stay in Durango. Cozy, updated home with plenty of room. Hosts very accommodating! Our family absolutely loved our stay! Beautiful views and a beautiful home with great hosts! Our family absolutely loved our stay! Beautiful views and a beautiful home with great hosts! It was my family's first time in Durango and this Farmhouse made the right impression on them. I am so glad we stayed!